The entire point of the Civil War was to end slavery, right? Not exactly, and definitely not at the beginning of the War. The North went to war strictly to save the Union and had little interest in abolishing slavery in the South. The Emancipation Proclamation of 1863 only came about due to a complex convergence of political, social, and cultural interests. This podcast episode is part 8 of a series that historians Scott Rank and James Early are doing called “A History of the Civil War in 10 Battles.” We look at the reasons that the Emancipation Proclamation happened, the tipping point that made abolition turn from something unthinkable in early America to a rallying cry for the North, and the factors that make wide-scale social change possible. For the first 18 months of the war, slavery was in the background for the North. The North went to war strictly to save the Union. As long as saving the Union was the only war aim, there was a great sense of unity in the North. Soon, however, there was a growing debate about what type of Union there would be after the war: with or without slavery. Related to this: would the war be a limited war aimed at bringing the South to negotiations, or would it be an all-out war aimed at remaking the South in the image of the North? In his inaugural address in March 1861 and again in July of that year, Lincoln reaffirmed his campaign promise to not interfere with slavery where it already existed. Congress also passed a resolution (almost unanimously) that summer saying the same thing. Part of Lincoln’s (and Congress’) motivation was to not alienate the border states. Lincoln personally hated slavery, but he had to move very slowly to restrict it. The majority of northerners agreed: they did not like slavery, but they did not care to interfere with it in the South. Conservatives wanted slavery to end eventually, but only very gradually, and voluntarily. The wanted to tie it to colonization. Moderates (including Lincoln) wanted to end slavery sooner than the conservatives, but not immediately. They feared a race war and other problems if the slaves were freed too quickly. Some also favored colonization. As the war progressed, some moved toward the radical position. Radicals wanted slavery ended immediately. They wanted emancipation as a war aim from the beginning. They were a minority in the party but were very vocal and aggressive. They were disproportionately represented in the House and Senate. 1. Nearly all Democrats opposed emancipation. This idea went back well into the 18th century. Some wanted it for racist reasons. Others (like Lincoln) were in favor of it because they felt that blacks and whites could never function together in society together. Lincoln met with a group of black leaders trying to convince them of the necessity of colonization. He asked for volunteers to go. Frederick Douglass criticized Lincoln for hypocrisy. In April of 1863, a group of about 500 blacks volunteered to immigrate to Haiti. Once they arrived, disease swept through the colony. A year later, they asked to be returned to the US. In April 1864 a US ship picked them up and brought them back. Only 368 survived. This was the end of talk of colonization. Tens of thousands of slaves ran away to Union Army lines (maybe up to half a million). This forced the US Army and government to come up with a solution to the problem of slaves in the South. Runaways weakened the Confederate economy. Abolitionists called for emancipation as a war effort from the beginning of the war. They acknowledged that the Constitution protected slavery. They saw slavery as a great moral evil, but they realized that most northerners did not. So, they argued that slavery was essential to the Confederate war effort, and its abolition would damage the South’s ability to make war. International law said that in a war, any of enemy’s property that helps them to wage the war is subject to confiscation. In August 1861, General John C. Fremont declared the slaves of all rebels in Missouri free. This made him a hero among Radical Republicans. Lincoln countermanded this order. May 1862, David Hunter issued an order freeing all slaves in his department (parts of SC and GA). Lincoln also revoked this order, saying only he had the power to do this. Radicals criticized Lincoln for these actions. August 6, 1861: Congress passes the First Confiscation Act. It said that owners of slaves in military service forfeited their ownership of the slave. This only applied to slaves directly involved in supporting the war effort. March 1862: Congress forbid Union commanders from returning escaped slaves to their owners. But it did not say the slaves were free. April 1862: Congress abolished slavery in the District of Columbia with compensation. June 1862: Congress abolished slavery in the territories, without compensation. July 1862: Congress passed the Second Confiscation Act. It said not only that runaway slaves could not be returned to their owners, but also that any slave that escaped from a Rebel owner was free. In the spring of 1862, Lincoln wanted to implement gradual, compensated emancipation with colonization. He asked Congress to provide funds for this. They agreed. Lincoln twice tried to persuade leaders in the border states to accept emancipation. They refused. 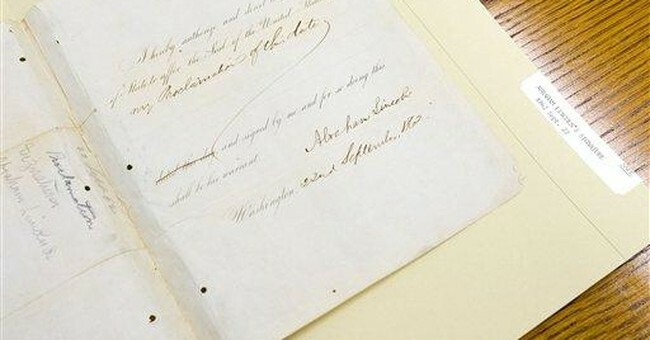 Lincoln then (in July) decided to issue an emancipation proclamation. He told his cabinet (surprising them). William Seward persuaded him to wait until the Union had won a victory before issuing it. Freed slaves in all parts of the U. S. still under rebellion on January 1, 1863. It urged the border states to come up with a plan for emancipation. All of these measures were given solely as military necessity. This meant that parts of LA, VA, and the entire state of Tennessee were excluded, as were the border states. Lincoln was criticized by many, saying this was just a paper measure. Southerners and many northern Democrats said Lincoln was being hypocritical. Southerners said he was trying to incite slave rebellion. The proclamation changed the Union war aim. Now the war was not just to save the Union. It was that, plus a war to abolish slavery. Now wherever the army went, freedom went with it. The Proclamation also authorized the use of Black soldiers.